Anyone used underwater led lights? Re: Anyone used underwater led lights? Hmmm... I have looked at these underwater lights, unfortunately I am of no help...but I look forward to any responses. I like the idea of underwater lights, just not sure what to consider...good question! Thoughts from others? usually low power, but it really depends on what you would like to use it for. I just kinda want some sort of light in the tank as the lamp doesn't really do much good lol kinda glares off the glass and I had thought about just getting one to set on top of the screen lid but where I have the filter in there it doesn't sit right so I won't chance a light on that. Amazon says it will be here by the first or second week of April so I will have to see when it gets here but I would assume it would be somewhat more helpful than the lamp. I bought some years ago a blue light that I wanted to use as a kind of night lamp in the tank. The light worked fine however the suction cups didn't hold the weight of the tube and the lamp ended up on the gravel every time. I forgot to replace the flourecent canopy on top of the tank after cleaning I normaly place it shining trought the back of the tank. On time I forgot and liked the efect and left it with light shinning through about 1/2 way up across the back. We picked up a blue LED light with an airstone tube together ... for the rear base of our paludarium ... all I can say is it's on for 12 hrs a day .... and already half the LED's are burnt out. It was cheap and now I know why. We do like the ambiance it gives at night in a dark room ... plus the shadows of the fish on the walls .... my son comments on. Their are good ones out there I know ... and I'll be shopping around and checking a bit more when we finally replace this one. I've only had in since Oct. Here is my LED. As you can see, it is for decoration and ambiance only. It looks kind of cool when all the other lights are off in the room. I have some other ones with suction cups to stick on the sides of the glass, that came with a used aquarium several years ago but just never got around to trying them out. I think one was blue and one white. Guess I should dig them out. That's kind of cool Starfish, and cheesy at the same time. Don't LEDs affect certain fish though? I know I can't get any as they mess with my ID sharks. Oh no, I hope not...I have a pleco and 2 redtailed black sharks in the tank I am going to be using this light in...unless I luck out and find them a bigger tank before hand! 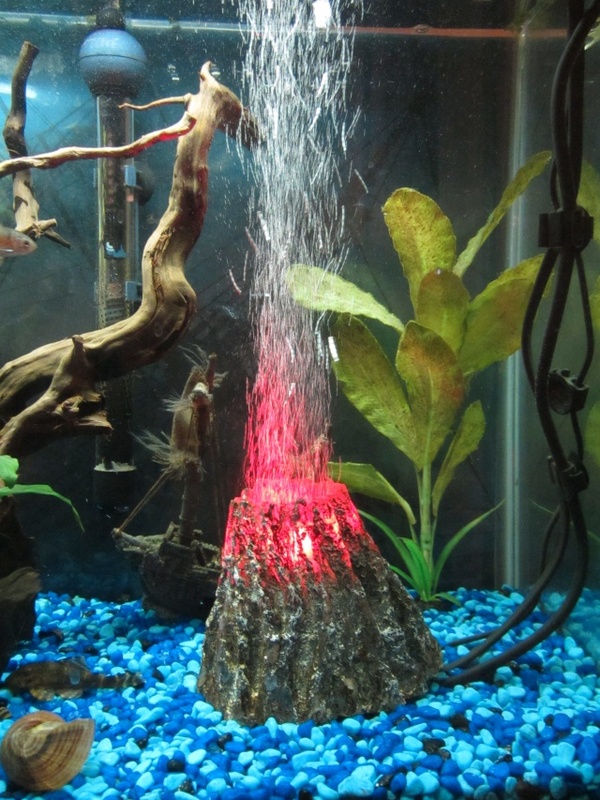 @Sandman1969 wrote: Don't LEDs affect certain fish though? I know I can't get any as they mess with my ID sharks. I'd never heard of this and would like to know more .... We have LED's on 2 of 5 tanks. I know there should be a dark time period, for sleeping patterns for most species of fish. 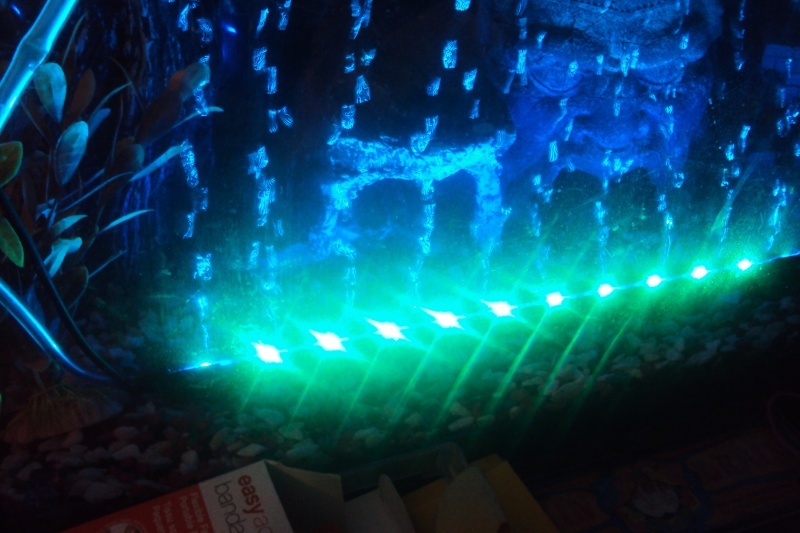 But I'd never heard of LED's being harmful to any fish per say. I know I can't use them as it would drive the ID sharks stir crazy. @Sbenson11 wrote: That's kind of cool Starfish, and cheesy at the same time. I first saw it at Big Al's, but then found it on Amazon.ca for half the price so ordered from there. Yah, it is cheesy, but I like it. Love Amazon! That's where I ordered my light from. A lot of fish orient by light, so a light in the tank would set them off. That is more common with open water, quick moving fish, and very few of them are in the hobby. In the wild, a 'shark' would navigate great distances at high speed, so where the light is matters to them, be it the moon or sun. Plecos and red tails don't travel much. I don't think it would bother them. I use one screen topped reptile tank (it holds water just fine) and put a suspended pendant light over it, from the ceiling. It gives a nice effect, especially in the evening!